September 8th, 2010 marked the beginning of year 5771 of the Jewish calendar and for those who don’t know this, it is also the beginning of the Jewish High Holidays. These are the most important holidays on the Jewish calendar starting with Rosh Hashanah and culminating 10 days later with Yom Kippur. These 10 days are commonly referred to as the “Days of Awe”, a time to contemplate your conduct in the previous year as well asa time to set goals for the next year. These 10 days also focus on repentance for the past years indiscretions in an effort to not repeat those mistakes in the coming year. In reflecting on all the changes in my life this past year I’ve thought a lot about my decision to live the primal lifestyle. Its been almost 4 months now and I truly believe the changes in my life are remarkable. I feel fitter, stronger, healthier and happier. These were my original goals when I started on this journey and honestly I couldn’t be happier or prouder of this decision. Of course, in the spirit of confession that is typical in the Jewish faith at this time of the year, I also had to reflect on how faithful I was to the “primal blueprint”. I believe that I’ve done really well. Of course, no one is perfect, but that’s what makes life so interesting. On a camping a trip over weekend, and after a few to many glasses of wine, I ate a Hostess Ding Dong and Oreo cookies. I’m not gonna lie. They were as good as I expected them to be. However, I really don’t feel that bad about eating these sugary, floury delights. I know I won’t be having another one for a long time. I’d like to say that I will never eat another one again. But, that is not realistic. Rather, I will simply reaffirm my commitment to not eat this type of food in the next year. I will strive for 100% commitment, and I will be fitter, stronger, healthier and happier as a result. I am sure that this next year will prove to be even more remarkable. Of course, Jewish Holidays typically include some sort of festive meal. My Mom always made a Honey Cake on Rosh Hashanna. It is tradition to mark the new year with something sweet. As a kid this always meant dipping freshly sliced apples in sweet honey and Honey Cake after the traditional meal. Just because I have decided to live primally, however, does not mean that I have to give up this tradition, I simply have to reinvent it. So instead of making the typical Honey Cake made with tons of flour and sugar like my Mom’s, I made a primal version that is still sweetened with honey, but contains no refined flour or sugar. I was really pleased with the results. It was dense, delicately spicy, moist and, just like the original version, went really well with a good cup of coffee. Honey is supposed to encourage a sweet new year and while you might not be celebrating the new year you should try this delicious cake and have a sweet year as well! Preheat oven to 350º. Generously oil a 9″ round or square cake pan. In a small bowl, pour some hot water over the raisins to soften and let cool. In a large bowl, combine almond flour, salt, baking soda, cinnamon, cloves and allspice. In a separate bowl, combine vanilla, honey, eggs and almond oil. Beat until smooth with a hand mixer. Add cooled coffee and beat to incorporate. Add the wet ingredients to the dry ingredients and beat with hand mixer until smooth. Drain the raisins and stir the raisins into the cake batter. Pour the batter into the well greased cake pan and bake in the 350º oven for 30-35 minutes. Check the cake after about 25 minutes. It will be done when a tooth pick placed in the center of the cake comes out clean. When the cake is done let cool and serve. Traditionally, this cake is not frosted, but you an top it with homemade whipped cream or cream cheese frosting. To make the frosting you can simply beat together softened cream cheese and honey until you get a smooth spreadable consistency. Enjoy and I hope you have a healthy and sweet New Year. 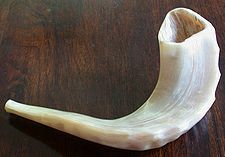 From one Primal Jew to another, L’Shana Tovah! I made my family’s dinner this year and was able to keep it mostly primal (except I made REAL matzoh balls, I just couldn’t use almond flour) and I decided NOT to feel bad about it. Can’t wait to try your cake! Definitely going to try this, sounds amazing. Thanks Jen – hope all is well and can’t wait to see you guys again! Hey great to have found another recipe primal blog. I found it through Primal Toad’s. Have added you to my blog links. I tried these tonight and they were delish! I had to make a few substitutions. To keep the carbs down, I used a sugar free syrup in place of the honey. Didn’t have clove, so I used Pumpkin Pie Spice. And since I had it, I threw in a little flaxseed meal. I used olive oil, as I didn’t have either of the other two options on hand. The result was extremely moist and tasty. I have no idea how it compares to the traditional honey cake, as I’ve never had one, but I was pleased with this. I mixed up some cream cheese with sugar free hazelnut syrup as a topping, but I think I actually like it plain better. Love the blog, keep it up! I am curious what sugar-free syrup you use. I am on my first bottle of syrup, and might venture out to another brand next time to compare a few options. This time it is “Log Cabin”. The 8g of carbs listed per serving are all sugar alcohols. There are some decent low-carb pancake recipes I have tried, one which involved grinding pork rinds into a makeshift flour. Believe it or not, it was pretty tasty! I’ve also been using the Torani sugar free syrups. The Hazelnut is my favorite, and I’ve used the chocolate and raspberry as well. I’ve yet to see the Vanilla in the store, but I’d like to try it.